The LEGIT way to eat healthy this summer. Call it an attempt to eat healthy, ability-to-look-pretty or plain laziness — anything dumped and served in a bowl these days is deemed hip and trendy. 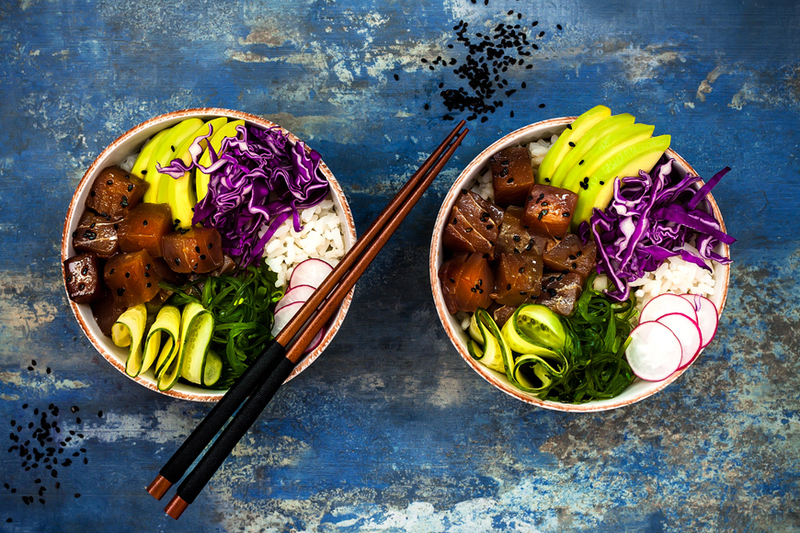 Case in point: Buddha bowls, veggie bowls, smoothie bowl or the latest in the market: Poke bowls. Now, if you haven’t heard about these — don’t worry — you’re not behind the latest Instagram food trends. The trend actually started in Hawaii so it’s still new to the Middle Eastern audience. Pronounced POH-keh, this exotic bowl is a combination of chopped raw fish, rice, and vegetables. The traditional Hawaiian dish of marinated fish is wildly popular in the region. The contrast of hot grains and cold, marinated salad is part of the appeal why poke is making rounds across the globe. How to make your own poke bowl? Since the poke bowl trend will soon hog your timeline, it's important that you learn how to make one at home. All you need are some good-tasting and complimenting ingredients, little chopping, and you have a simple, satisfying meal. Here are the 4 basic steps to making your own poke bowl. Cooked rice (sushi or brown), vegetable noodles, or shredded salad greens. Fish is a crucial part of a poke bowl. Tuna is traditional in Hawaii, but you can use other kinds of firm, thick fish. Cooked shrimp or crawfish also are good options. Step 3: Add toppings - as many as you want. Shredded zucchini, seaweed salad, shredded daikon radish, or other radishes; microgreens, chopped avocado, toasted sesame seeds, chopped cashews, black sesame seeds, minced garlic - you can go on and on. If you didn't marinate the fish, sprinkle on a sauce or two. If you marinated it, you probably won't need more sauce.